The mobile bubble-popping game is adding a new character, and fans will get to name her. If you're a fan of iconic gaming mascot Pac-Man, then you might be interested to hear that not only is he still being featured in games, the yellow fellow has a mobile game making the rounds these days. 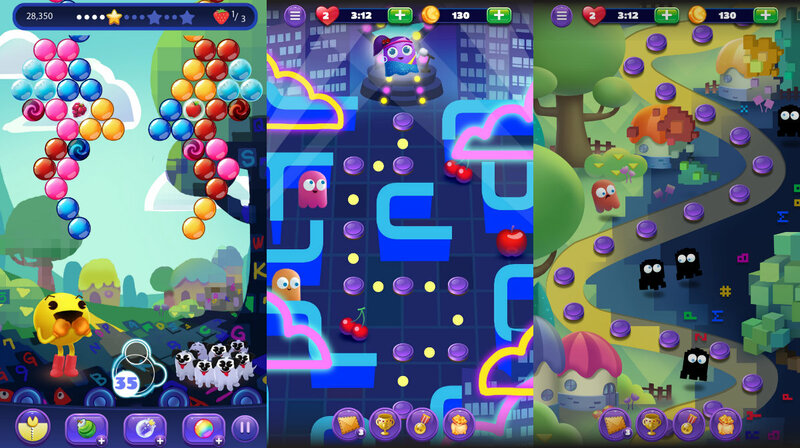 Pac-Man Pop, the bubble-popping matching game, is looking to shake things up a bit more now by expanding on the classic roster of villainous ghosts. You're no doubt familiar with mainstays Inky, Pinky, Blinky, and Clyde, but now a new ghost is looking to add a bit of style to the scene. The new character is a purple female ghost sporting a headband and a ponytail. You'll notice I haven't given you her name, and that's because Namco wants the fans to help name her. An online poll is being held from today until the end of the day on February 22. You've got four options to choose from — Winky, Bonnie, Violet, and Dot. Personally I'd lean towards Winky, if only so that Clyde can continue to break up the rhyming scheme. When she arrives she'll be bringing with her a new challenge mode and rewards as well, so if you're looking to pop some bubbles with the newest member of the supernatural crew, then keep an eye out for more info when the name is decided.